short girl, long island. : Teach Me Something Thursday, Volume Seven. The seventh installment of TMST is another Halloween themed gem, from my friend Corinne, the blogger behind Brilliant Nature. She used to live on Long Island, but recently relocated to Tennesse with her boyfriend, Andrew. If she still lived here, she would most definitely be a part of our blogger craft nights, but as you'll see from the post below, she's being super crafty in her new home! When Michele mentioned Halloween themed TMST’s, I knew I had to jump right on it. Ever since I was a kid, Halloween has been my favorite holiday. It’s right in the middle of autumn (the best season), something to really look forward to in October (the best month), and everything about it has always felt magical. If you got to know me, you would understand why it’s so important. Even just as a human, how can you not appreciate the crisp air, happy children, an excuse to wear costumes and wigs and face paint, celebrating in the street at night, and free candy?! C’mon. Turns out the day after Halloween is also a holiday! I remember learning a little bit about Dia de los Muertos (Day of the Dead) in elementary school, but I went to Catholic school, where we would celebrate All Saints Day on November 2nd, and we never delved too deeply into the history of Dia de los Muertos. I’m self taught on what I’ve learned is an important day in Mexican history, so I want to teach you too! Dia de los Muertos, as I just mentioned, originated in Mexico. Translated to Day of the Dead, it is celebrated on November 1st. The purpose of this holiday is to pray for and commemorate friends and family who have passed. It is celebrated in connection with the Pagan holiday of Samhain, and the Catholic’s All Saints Day and All Souls Day. The holiday has spread throughout the world. In Spain, Dia de los Muertos is celebrated with festivals and parades, and in Brazil people celebrate by visiting churches and cemetaries. All in celebration do focus on the one true meaning which is to remember loved ones who have passed. Often, the favorite foods and drinks of those who have died are prepared. Dia de los Muertos celebrations can be traced back about 3,000 years. 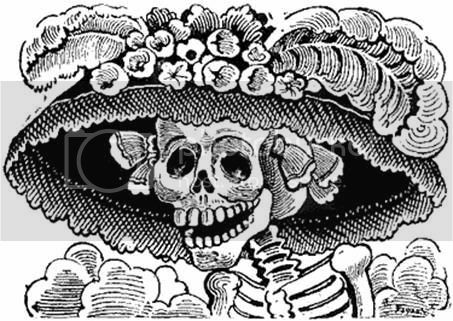 And though I find it a bit morbid that pre-Hispanics kept the physical skulls of loved ones lost to symbolize death and rebirth, overall I think it is an absolutely beautiful tradition, made more by the traditional artwork. The figures of Catrinas (shown above), marigolds and my favorite – Calavera, more commonly known as sugar skulls. So, in conjunction with my history lesson, I prepared a little craft! She’s simple, but I’m proud of her. I found the paper mache skull at Michael’s sometime in August and I knew just what I wanted to make of it, even before I took on the (super fun!) task of TMST. I painted her white with standard acrylic paint and drew on the design with Prismacolor and Sharpie markers. If you do a quick Google image search for sugar skulls, you will see that they can display literally any designs, shapes, colors or textures that you choose. I went with floral because that’s just my style – and the marigolds stick in my head whenever I think of Dia de los Muertos. Isn’t she pretty? 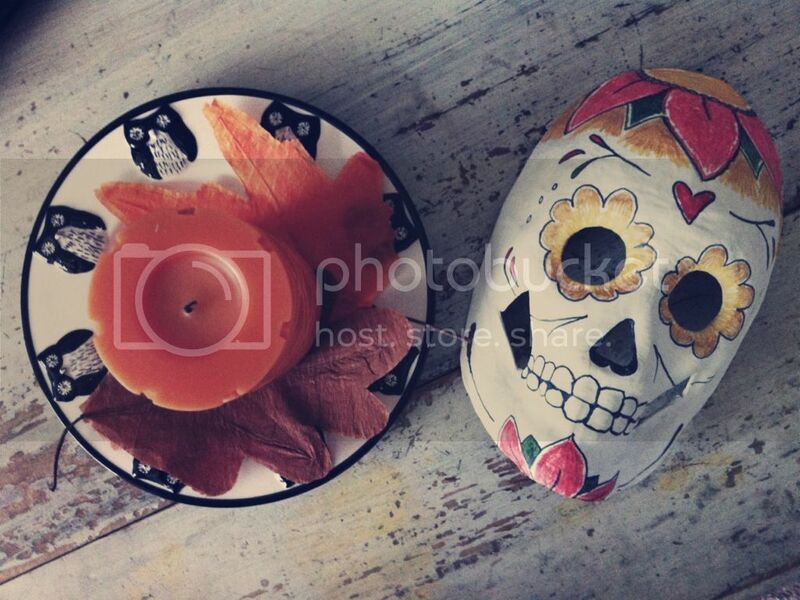 Share with us your Dia de los Muertos history, fun facts, or any crafts you’ve made relating to this special day! For more autumn inspiration + awesomeness in general, head over to Brilliant Nature.